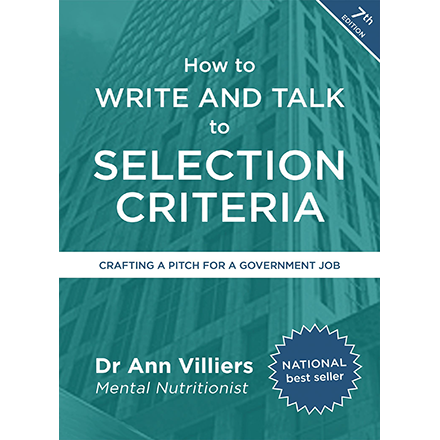 Dr Ann Villiers is a leading expert in public sector staff selection and retention. Specialising in the sense-making process, her approach stems from her combined business and public sector management experience, spanning more than 20 years, on both sides of the selection process. Managing a career, selecting staff, preparing a job application and performing well at interview are all exercises in sense-making and managing meaning. Staff need to be career activists, taking responsibility for their learning and work within the context of life circumstances. Selection panels must make sense of the job vacancy, the selection process and what applicants are offering. Applicants must make sense of the job vacancy, the organisation, the process and what they have to offer, both in writing and orally, plus the result of the process. Author of How to Write and Talk to Selection Criteria, (6th edn.) and a range of tools, ebooks and articles, Ann has presented at a range of conferences and professional association meetings. She currently coaches individuals so they unlock their potential and hold the keys to greater job success. Australia’s only Mental Nutritionist®, Dr Villiers is a career coach, writer and author, specialising in mind and language practices that help people build flexible thinking, confident speaking and quality connections with people. You can read Ann’s biographical details.